1958 h model running gear 673 mack engine 5&2 trans, mack rear, not sure of ratio, no radiator I live in ohio,,,unit is in Montana,,,Don't have a clue what it is worth,,any suggestions??? 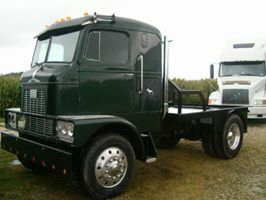 drove it home,then put cab on a newer mack running gear.....don't have pics of running gear but may be able to get some..have contact there...pics are of my h model for reference purposes ,the truck is NOT for sale only its original running gear thanks! Very nice looking H67 you have .